Corvus Energy wins Environmental Award at the 2016 Offshore Support Journal Conference, London. The Environmental Award sponsored by Nor-Shipping is awarded to a company, project or product that has made a significant contribution to a reduction in the environmental footprint of the OSV industry. February 11th, 2016 -Richmond, BC: Corvus Energy wins the Environmental Award, sponsored by Nor-Shipping, for its lithium ion battery-based energy storage system at the Annual Offshore Support Journal Conference, Awards & Exhibition in London. The entire offshore industry from across Europe and key established and emerging markets from around the globe were represented with over 500 industry professionals converging in London for this year’s event. A highlight of this event is its dinner and awards, recognizing industry-leading innovation, operational excellence and achievement. A hallmark of these awards is that, in all but two categories, they are voted on by the industry – nearly 100,000 votes were cast. the award is determined by the votes of the readers of the Offshore Support Journal. We are honored to receive the Environmental Award at the OSJ’s Annual Offshore Support Journal Conference, Awards and Exhibition” said Andrew Morden, Corvus Energy’s President & CEO. “Corvus Energy is the leader in providing safe and proven energy storage solutions to hybrid offshore vessels, enabling operators to dramatically reduce fuel consumption and harmful emissions. Our new partnership with Statoil will allow us to accelerate change in the offshore industry for the betterment of all who rely on these natural resources”, he added. Corvus energy storage systems (ESS) such as those installed in the offshore vessels Viking Lady, Edda Ferd and Edda Freya are proven to enable these vessels to consume less fuel, operate more efficiently and effectively, and emit substantially less greenhouse gases. 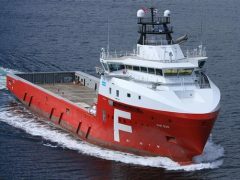 Corvus Energy recently announced an investment from Statoil Technology Invest to build on its success in the offshore supply and service market where Corvus has demonstrated its technology is perfectly suited to the sector’s stringent performance, safety and operational requirements.